The MCM-9000U is a software-only multiviewer that supports multiple formats on the same platform. TAG, known for providing advanced IP monitoring and high-quality UHD multiviewers, treated NAB NY attendees to an even higher level of displayed sophistication. 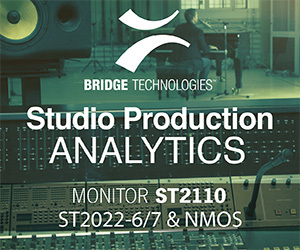 The company’s MCM-9000 supports SMPTE’s ST 2110 standard suite for managed IP networks. TAG’s MCM-9000 is a software only, all IP-based UHD multiviewer and monitoring system optimized to address the the needs of facilities using SMPTE ST 2110 standard for HD and UHD imagery. The software supports multiple formats: compressed, uncompressed and OTT (HLS and MPEG-DASH). A key benefit is that it does so using the same platform, which enables the MCM-9000 to adapt to changing requirements without having to purchase and replace equipment. Because the software and licenses remain the same when new peripheral gear is installed, costs are minimized over the product's life span. The MCM-9000 multiviewer/monitor runs on COTS hardware, making it easy to implement while minimizing overall cost of initial ownership. Low latency is critical for any high-quality multiviewer and the MCM-9000 has less than 2-frames delay, which makes it ideal for production and post-production applications. Also it provides a complete monitoring solution for all the transmission layers of both uncompressed content and compressed MPEG-TS HLS/MPEG-DASH, starting from the TS packet header all the way down to the encoded video content and its quality. Capable of high server density, the MCM-9000 is capable of in-taking large quantities of uncompressed sources and displaying them on the same screen. The result is the ability to create and display more tiles and therefore potentially reducing the number of required monitors and interface devices resulting in greater hardware efficiency. TAG's implementation of uncompressed UHD 2110-21 output – still the first of its kind in the industry - results in unmatched picture quality at the multiple UHD IP mosaic outputs. The outputs from the monitored services also feature rich data overlays that serve as a strong tool for real-time error detection and alerts. The entire scalable solution is supplied on a dongle equipped with a reliable and stable Linux kernel. The system boots directly from the provided flash, which requires no installation, no hard drive, or any type of OS on the server. The system also can function in a Virtual Machine (VM) environment by using a VM image instead of a dongle. The increase of IP technology, now merged into broadcast links, requires new test equipment. This article looks at RF IP probes and video monitors.